When it first unveiled Windows 10 last year, Microsoft briefly talked about a new feature called Continuum, but back then it was in the context of switching UIs on convertible devices based on whether you have the keyboard connected or not. And Continuum can still do that, but in the final version of Windows 10 Mobile it can do so much more. Continuum kicks in when you connect your Lumia 950 XL to a monitor, keyboard and/or mouse via the proprietary Microsoft Display Dock. The UI you'll see on the monitor won't just be a 1:1 representation of the handset's screen. Instead, the phone is basically turned into a makeshift PC, which will even work with a mouse and keyboard for interaction. Wireless Bluetooth peripherals work too, but of course, you connect them to the phone, not the dock. Yes, it's a Windows Desktop, the same one you see every day on your Windows 10 PC but without the icons and without a right click action on the mouse. Upon connection you see your phone's Start screen on the left side of the monitor, but if you open a universal app that will take over the whole width of the monitor, as you can see from the screengrabs above. So you'll have no wasted space, and you'll be able to do some work in a much easier way than if you were to simply glance at a representation of your phone's screen. The task bar is there, Cortana, Task View, and the Start Menu making much more sense now as it's actually your phone's screen. Oh, and you can continue to use your Lumia 950 XL, while it's connected to the dock, it doesn't lock the screen at all. How cool is that? Furthermore, all the usual PC keyboard commands work in this mode, so you can use Ctrl+C for copying, Ctrl+V for pasting, and so on. Microsoft says it wants to let smartphones scale up to a full PC-like experience and they've done a great job out of it. You may remember that Ubuntu came up with a similar concept a few years ago, but the Ubuntu for Android project flopped eventually - perhaps because it was trying to do more (run 'full' Ubuntu when the phone was docked), but also because it wanted to pair two different operating systems from two different companies on the same device. In Microsoft's case, it's all Windows, so Continuum actually makes sense. Microsoft's proprietary Display Dock is recommended for Wired or Wireless connection with the Lumia 950 XL. From there it's all wired - you need to hook up your display with an HDMI cable, and connect a keyboard and a mouse. You can use wireless peripherals, most of the USB dongles for connecting accessories worked just fine. The dock is small and beautifully designed - besides the USB type-C ports for charging and connecting the phone, it offers 3 USB 2.0 ports, an HDMI output and even a DisplayPort. There is even a microUSB. The accessory doesn't come cheap ($99, €109), but many retailers are offering the Lumia 950 XL with a free dock, which is nice. If you don't want to spend a small fortune on the Display Dock, there are alternatives. You can use the Miracast protocol to connect to an external display, which will enable Continuum. But for the input you can either connect Bluetooth keyboard and/or a mouse, or use the virtual touchpad and keyboard on your Lumia 950 XL's display. You can do the same with a proper USB-C to HDMI adapter as well, and once again rely on Bluetooth accessories for input or your phone's display. Not using the dock saves you money and spares you an additional accessory, but if you need to connect SD cards, USB sticks, among others, you will need the dock. Don't forget the Display Dock also (fast) charges your device. So, is Continuum really worth it? Sure, but there are lots of limitations you should be aware of. For example you can't install Win32/Win64 desktop apps, just ARM-compatible from the Windows Store. The case is somewhat similar with the original Surface RT. We didn't expect the Lumia 950 XL to do so, but lots of people might have been misled to believe so during the announcement. Once you hook all the necessary cables to the dock (the phone, the charger, the HDMI cable, keyboard (optional) and mice (optional), you are good to go. There are no need of drivers or additional app installations, the Continuum app launches up automatically and your screen will light up with a Windows desktop. The Lumia's display acts as touchpad, and if you don't connect a keyboard, you can use it as a keyboard, too. You can opt to close the Continuum phone app and continue to use your phone. As promised, you can still use your phone, while you are using the Continuum screen. You can make calls, check emails or write messages. You can explore photos or shoot with the camera. You can't open the same app twice though, so if you have Photos open in Continuum and try to open it on your Lumia screen, it will just move to your phone display. As it turned out, there is no actual desktop to put app shortcuts and files on. It's just a static picture needed to fill the blank space. Your actual desktop is the Start menu, which doubles your phone's default Start homescreen. All apps pane is available as well. When you are running in Continuum mode, most of the basic shortcuts you are used with in Windows work - copying, paste, explorer (launches the phone's file manager though), but not Show Desktop as there is no desktop to show. The Edge browser, Word, Excel and One Note ran smooth and looked a lot like their Desktop counterparts. You can indeed do more with Continuum and replace some of your Desktop functionality, but not all of it. As promised, you can still use your phone, while you are using the Continuum screen. You can make calls, check emails or write messages. You can explore photos or shoot with the camera. You can't open the same app twice though, so if you have Photos open in Continuum and try to open it on your Lumia screen, it will just move to your phone display. Windows Continuum works fine and with the expanding app portfolio it will find its loyal users and probably expand the Windows user base and market share. Microsoft Lumia 950 XL runs on the top of the infamous shelf Snapdragon 810 chip, which has created a controversy because of its overheating issues. That's why Microsoft took a different approach in solving those - instead of throttling the chip, it applied a liquid cooling system. Microsoft used the same cooling for the Surface tablets, so it's experienced with this kind of thing. The liquid cooling sure takes off the heat, but the phone still gets warm, so don't expect miracles. But the good news is the Lumia 950 XL never gets beyond warm under pressure, unless you use Continuum - then it becomes quite warmer but the reason is perhaps the charging that's going on simultaneously. The new cooling helps indeed and we never experienced the so-called hot phone, throttling or stuttering because of heat, or similar. The phone runs smooth even when you put some load on it. The Snapdragon 810 chip offers an octa-core processor, Adreno 430 GPU and 3GB of RAM. The CPU uses 4x 2.0 GHz Cortex-A57 & 4x 1.5 GHz Cortex-A53 cores and coupled with the 3 gigs of RAM it should be perfect for multi-tasking and Windows Continuum. The compound BaseMark OS II 2.0 gauges CPU, graphics, memory, web and system performance and the Lumia 950 XL does as well as the Galaxy Note, also powered by the Exynos 7420 chip. It does 15% better than the Lumia 950 (S808). The Adreno 430 is among the most powerful GPUs around, and it shows some nice skills on the BaseMark X GPU test, close to the Mali-T760MP8 inside the Galaxy S6 lineup. It also scores about 20% better than the Adreno 418 inside the Lumia 950, so we could say the XL GPU is 20% faster than the one inside the regular model. 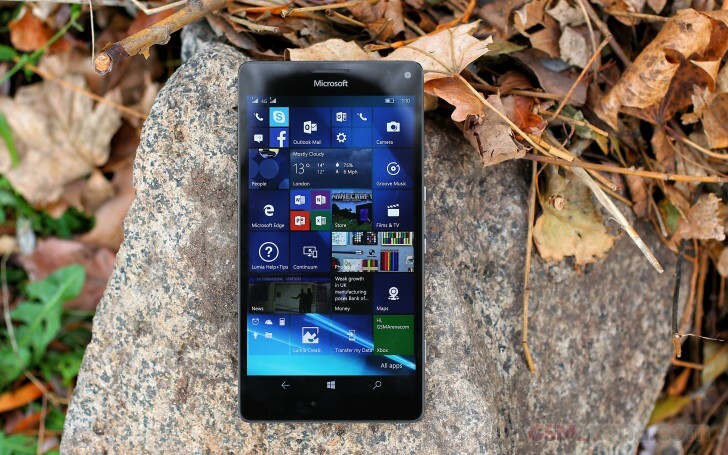 The Lumia 950 XL is clearly powerful enough to handle Windows 10 Mobile and whatever you install on it. The Windows Continuum is amazingly responsible. 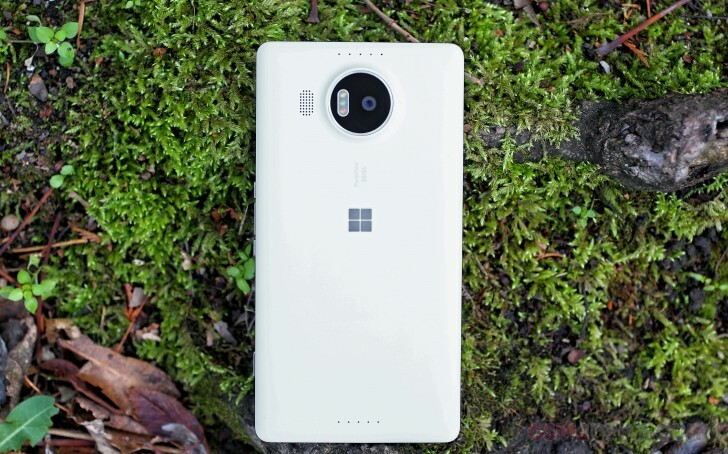 There are lots of games already available, while other popular titles are coming as well, so the Lumia 950 XL and its powerful GPU are perfect for gaming, too.